April 09, 2013 "The advantage of the SmartSound system is you can work the Hollywood way, where music is composed to picture after picture lock." Explosive growth in the video and multi-media fields have led to huge demand for products easily adapted to the visual mindset. The advantage to you is that not only does SmartSound take the worry out of licensing issues, it allows you to quickly produce professional quality music editor results through its patented timing control and instrument control technologies. SmartSound’s audio products were the very first on the market to focus exclusively on the needs of visual creators, as opposed to musicians or audio engineers. The huge array of albums, sound effects, and atmospheric beds (more than 3500 tracks in all) allows the video producer to tweak the scene’s emotional content to a “T,” with sophisticated musical accompaniment. By taking advantage of SmartSound’s custom length feature creators can tailor the music to the exact second of a scene’s length. The music is made in a way that allows you to customize it to fit your production. This will make it sound like a custom score that was produced just for your project. You can choose any length you want and still get a musically sound intro and ending. You can also change the instrument mix to match what's happening on screen, and you can control the timing of the music to fit the events on your time line. It might sound complex, but it's quick, easy and it works great. SmartSound royalty free music is produced by professional musicians who’ve supplied music for feature films, TV scores and other major projects. According to David Sonnenschein, author of Sound Design: The Expressive Power of Music, Voice and Sound Effects in Cinema, he was able to teach people how to use Smartsound’s software in just a few minutes. He has found other audio-editing software can range in price from $30 to hundreds of dollars, but often come with a good-sized learning curve, as well as being very time-consuming to use. SmartSound is royalty free music made easy! What does the customizing entail? SmartSound tracks may be a single layer of all the instrumentation, or may be multi-layered, and also may include vocals/lyrics, with appropriate price points for each. With the multi-layer and vocals/lyrics added, within even a short clip you can add or subtract one or more of the individual instruments, such as Bass, Lead Guitar, Percussion, Rhythm Guitar, Piano, for example. You can adopt a “dialog” preset setting to quiet the music down enough to hear what’s being said. Then you can transition, at the exact second the scene changes, to a punchy drums-only segment. The transitions can be abrupt or smoothly drawn out to drift one sound to another. With these subtle variations your viewers’ moods can be enticed to turn on a dime, or feel all the power, drama and emotion the video creator desires. The possible variations are so extensive you could actually spin out a 3-minute song into a 2-hour production without playing the same passage twice! What about interface with my other software? The good news is that one of Smartsound’s advantages is, in addition to their own cutting-edge music-customization software (Sonicfire, Quicktracks), the company has partnered with Adobe, Avid Technology, Corel, Pinnacle and Roxio, to embed Smartsound’s technology in the outside software. You can customize your royalty free music online with QuickTracks and download .mp3, .wav, .ogg or .aiff files. 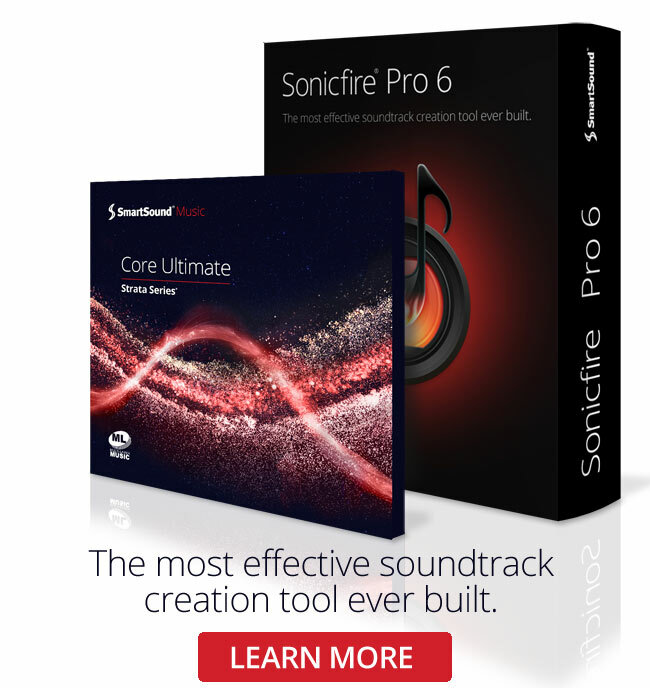 Or you can get the SmartSound Download file (.SSDL) and use the advanced features of Sonicfire Pro right on your desktop. Whether you use one of Smartsound’s music-editing software choices, or one of its partner’s, once the creating and customizing are done, they produce standard audio files that can be used by all video-editing software. SmartSound is the only Royalty Free Music Library that offers Lifetime Customization and Downloads to all of its users. When you buy SmartSound music it becomes a permanent part of your SmartSound Royalty Free Music Collection. You can log on to your BackStage account and download any music that you've purchased any time for life. You also have lifetime access to customize your SmartSound royalty free music online with QuickTracks, our quick and easy online musical customization service. The SmartSound Advantage is that it was designed with all the features you need to help you synchronize your video and audio efforts. Remember, someone may be a great musician, yet not be a good composer for a film. With Royalty Free Music from SmartSound you can take the best of what the expert musician has to offer, and orchestrate the perfect blend of your visual story and the richness of music!